The burgeoning and now International J/70 class will be showing the biggest growth at the event. 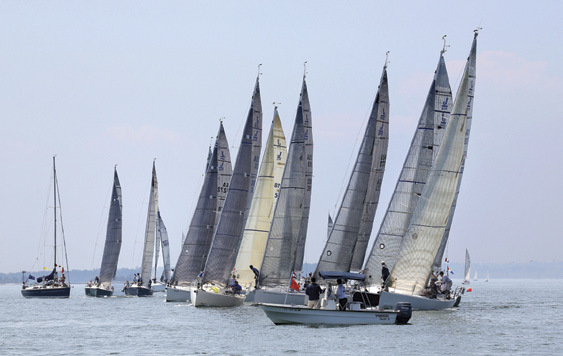 Last year, the regatta was the first one-design event for the Western Long Island Sound Fleet 15, and Gary Tisdale & Adam Burns’ Pig’s Ear (Youngstown, NY) topped the 9-boat fleet. For this year’s New England Championship, with qualification for the class’s first World Championship on the line, Cedar Point has had to limit the fleet to 40 boats and there is already a waiting list. Tim Healy of Jamestown, RI, the 2013 J/70 National Champ, will be racing and also leading a North Sails clinic on Friday, May 30 to help others learn how to make the hot J/70 go even faster. The J/109 class is making the Cedar Point event the conclusion of its East Coast Regatta series, which also includes the Annapolis NOOD. That should bring out perhaps 15 of these powerful racers, up from 11 last year, with many coming from beyond the Sound. In the Beneteau 36.7 class, William Purdy and crew of Whirlwind (City Island, NY) will be defending their victory last year, when they were awarded the Rex Marine Trophy for Best Overall Performance. That trophy was a three-foot-tall fully detailed model of the classic J Class anger, and another is up for grabs this year. Ashore, everyone will be fed on Friday, Saturday and Sunday night, not to mention breakfast daily. All of those meals included in the entry fee, as is the Saturday night raffle, with many prizes donated by generous sponsors. An Act of God…Just What Is That?